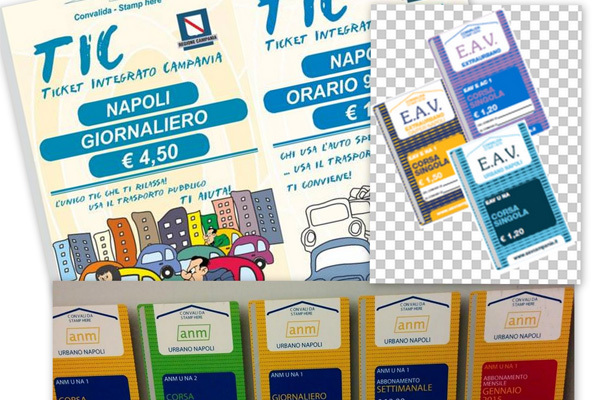 The ticketing agency for Naples and the Campania region is the Unico Campania consortium. In general, all riders need a ticket to use public transportation within the city, the province and the region and there are no discounts for age, except children under 6 years old, who don’t need a ticket if accompanied by an adult with a valid ticket (1 child per adult. Children cannot occupy a seat by themselves). Unico Napoli tickets are now called TIC tickets and are required for travel within the City of Naples (Comune di Napoli). TIC tickets are valid on: all city (ANM) buses; the four funicular lines;regional EAV buses, Metro Lines 1, 2 and 6, and the Circumvesuviana,Circumflegrei and Cumana lines within the confines of the city. Tickets are available for 90 minutes or for daily, weekly, monthly and annual travel. Unico Alibus tickets are required for travel via Naples Alibus (to and from Capodicchino Airport). Tickets are €3.00 at an authorised agent, €4.00 if purchased on board the bus. Tickets are valid for 90 minutes from the time of validation. They CANNOT be used for a round trip on the Alibus but can be used on a combination trip (Alibus followed by any other mode of transport that normally would be valid with a TIC ticket, or vice versa). If you buy a 3 day, Tutta la regione (the whole region) Campania ArteCard, for €32.00, then all your transport (using road transport (buses, trolleybuses); and rail and cable transport (Metro Line, funiculars, trams, Circumflegrea, Cumana and Circumvesuviana trains) within the region is covered for those 3 days. If you buy a 3 day ArteCard Napoli, for €21.oo, then all your transport (using road transport (buses, trolleybuses); and rail and cable transport (Metro Line 1 _ Metro dell’Arte, Line 2, Line 6, funiculars, trams, Circumflegrea, Cumana and Circumvesuviana trains) within the urban area of Naples is included. In addition to the changes above, the individual agencies (ANM and EAV) now also have their own tickets, which are valid on just their transport. Both companies now do single journey tickets, which are cheaper than the integrated TIC 90 minute ticket. These tickets cover one journey on any transport. The starting price for these single tickets is €1.00. There are also daily, weekly, monthly and annual tickets. It is worth noting that the difference between an ANM U NA 1 and ANM U NA 2 ticket, besides the €0.20 difference in price, is that the NA 1 can be used on all ANM suburban buses, metros and funiculars within the city, but the NA 2 is for use on buses that come from outside the urban area, but are used within the city, and for use on EAV or RFI train services. The full fare list for all companies can be found here. For more information about sight-seeing around Naples and the surrounding area (Vesuvius, Pompeii, Sorrento etc. ), please click here. Hourly, daily, weekly and monthly tickets can be purchased at any tobacco shop (tabaccheria) and many newspaper stands. There are also ticket machines at many of the railway, metro and cable railway stations as well as at selected bus stops throughout the city. Monthly tickets can be purchased only between the last four days of the month preceding the month of validity and the first two days of the month of validity. They are available at most tobacco shops. Hourly tickets must be validated in the electronic ticket machines on the buses or inside the train/metro stations prior to boarding. Daily, weekly and monthly tickets must be validated at first use and you must also fill out your name and date of birth on the back of the ticket and be able to provide identification on request. If a ticket machine is out of order you must validate your ticket by writing the day, month and hour on the back of the ticket in the space provided. If you do not do this and a ticket inspector checks your ticket, on the spot fines may be levied; being a foreign visitor to the city is unlikely to excuse you.